Mosaic galaxies – from where do galaxies get their stars? Massive elliptical galaxies are vast collections of aging stars, whose foundations were laid when the universe was young. As we’ve covered previously, they form via a complex, two-stage process. First, gas is drawn into a blob of dark matter to rapidly form a dense core of stars. They then gradually accumulate smaller galaxies over billions of years to build up an extensive outer halo of stars. These galaxies are some of the most interesting to study, and not just because of their great size. In the most massive of these, the stars are very different to those found in our own galaxy. This is perhaps not surprising: the environment found in these early galaxies is radically different to that of the Milky-Way. The density and pressure of the gas being turned into stars is much higher; the time involved to convert it all much shorter. One of the most intriguing results of recent years – covered by Astrobites at the time – is that the types of stars formed in these massive elliptical galaxies seem to differ from the local brand: giant elliptical galaxies seem to form many more dwarf stars than any individual region of the Milky-Way. Put another way, the stellar initial-mass function (IMF), which tells us the fraction of newly-created stars in a galaxy with a particular mass, is different in these galaxies. That might not sound important, but it actually has quite profound consequences, both for the galaxy itself (if less gas goes into manufacturing giant stars, fewer supernovae go off, so less energy gets re-injected into the gas) and for those of us who spend our days observing them (a large collection of dwarf stars are dimmer than one giant star of the same mass, so when we measure how bright these galaxies are and make an educated guess about how much mass they contain, we might be off by a significant amount). There is a problem with all this though: forming stars is a complicated business, the physics of which remains somewhat murky. Understanding exactly how the unusual conditions in these galaxies are connected to the stars they end up forming is an open problem. The authors explore how these results tie in with the complicated formation history of these galaxies. Remember all those smaller systems that get sucked onto the dense core? The stars in those are – presumably – not overly-rich in dwarf stars. The upshot? Measurements of the IMF in local, old galaxies that have been accumulating these small systems for many billions of years are really measuring an average IMF. This has the unfortunate effect of obfuscating any links that remain between a particular galaxy’s properties and the stars it contains, since those stars have come from a number of sources which we have no way to know about. These galaxies are a patchwork of stars with diverse origins. 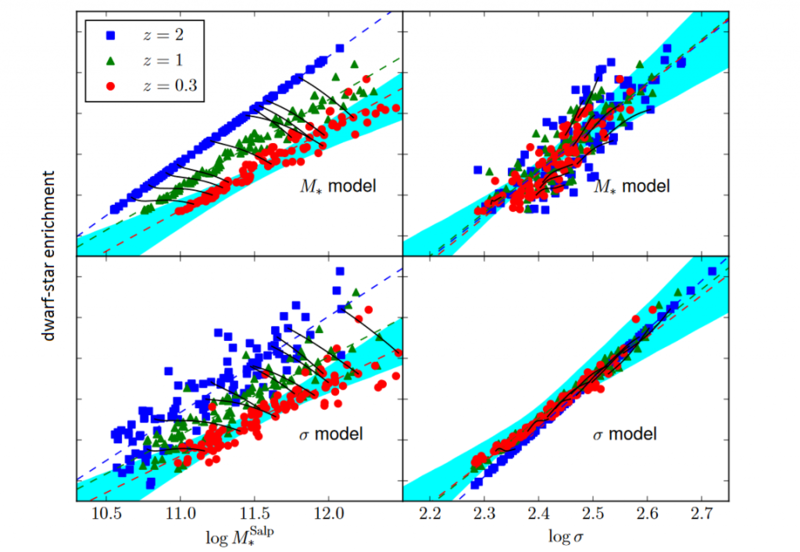 Using a model for the IMF of the precursor galaxies in conjunction with a model for the growth of these galaxies (via mergers with smaller galaxies) over time, the authors predict how the ‘effective IMF’ (the one we measure) might change over time. One of their main aims is to understand why it is that, at various times, different groups of researchers have claimed the IMF correlates with different galactic properties, such as total mass, or the velocity dispersion of the stars. These properties are themselves related, complicating matters further! Figure depicts dwarf enrichment of the stellar populations in a series of possible elliptical galaxies which the authors model, spanning a wide range in mass and velocity dispersion. The advantage of the model is that evolution over time can be followed, so the galaxies are shown at three times (blue, green, red – z is the redshift of the galaxy. Black solid lines connect a few representative galaxies, showing how they evolve between the three times as they accumulate more mass). The four panels model how the dwarf enrichment correlates with mass and velocity dispersion in two possible scenarios (in which the dwarf enrichment actually correlates with one or the other in the original galaxy before it accumulates mass through mergers). Figure 4 from the paper, modified. The figure above shows the authors’ key results. They examine two possible models in which the IMF actually depends on either mass or velocity dispersion (in the initial galaxy, before it merges with other smaller galaxies). They then evolve the galaxies forward in time according to a model prescription, and examine how these properties correlate with the measured (effective) IMF. As expected, they find that the two scenarios cannot be distinguished easily from data on local galaxies alone. They find that as the measured mass grows, the level of dwarf enrichment falls; this is because the low mass systems deliver extra mass, but dilute the dwarf enriched stellar population. If the IMF is initially connected directly to velocity dispersion, the measured relationship between velocity dispersion and the IMF remains constant over time; the accumulated systems have low velocity dispersion, so decrease the overall velocity dispersion when they dilute the stellar population. It is possible that future observations of more distant galaxies might allow us to distinguish the models (or even favour one not considered here), since the relationship between the IMF and these properties is found to change as the galaxies grow. Clearly, understanding variations in the stellar initial mass function of extreme galaxies is no mean feat. However, if it can be done, it could provide us with a vital link between the large scale properties of galaxies and the small scale, poorly understood processes that control star formation.